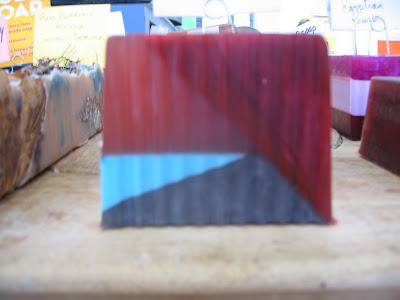 Taking the Geometry Lesson one step further, the soapinators at Otion created another soap creation utilizing the tutorial here. On a very positive note, I am in final testing stages for an flexible plastic loaf mold suitable for both CP and MP. I am doing to more tests today (springtime flowers MP loaf and a Peachy Keen CP loaf) much to the worry of my husband who still remembers the ruined wood incident (here and here). James, we’re probably 6 weeks off from approving and ordering the mold. I still have to make about another 6-8 batches in this prototype. Erin, I think the design would work with CP soap and you’d do the same thing with CP as you do with MP with the propping from side to side. Would this design work with cp? How would you do that? I love this. I have to get me one of those molds! It seems like you have been testing them for months now. Please tell us that you are close? Sure you post this today after my failed attempt at layering M&P yesterday!